When Ed Rondthaler and his wife Dorothy moved to Croton in 1941 they quickly fell in love with the Croton River, located across from their home on Nordica Drive. They became avid canoers and liked to paddle up and down the river, stopping to explore the remains of the old mill race, the abandoned, overgrown roads that led to long-gone bridges and other signs of the rich history of the area. One of their good friends was Theodore Cornu, who lived just down the road, in what had been the ferry house of Van Cortlandt Manor. “There is no other man living or dead who has tried harder or given more of himself to protect and preserve Croton’s natural resources,” Ed wrote in a 1976 article. “Cornu was not only a canoe-builder, but an artist, historian, naturalist, conservationist, and philosopher. During his lifetime of river exploration I suspect he paddled every inlet, every lagoon, crook and cranny of the Hudson and its many tributaries.” Through the years of their close relationship, Cornu passed on his love and knowledge of the Croton and Hudson Rivers. Departing from Camp in the Small Lagoon by Theodore Cornu. Pen-and-ink drawing from Hudson Valley Echoes, number 3, 1953. Another good friend was William “Bud” Haley, a noted stained glass artist and photographer who lived on Mt. Airy Road. Haley had a wonderful sense of humor and loved to create whimsical animals from bits of glass, wire, parts of tin cans and other found objects. This Bud Haley sculpture hung in the Rondthaler’s kitchen window for many years. During the long winter of 1947, Dorothy and Ed would sit in their living room after dinner and Dorothy would read books aloud, while Ed tried to find something to do while listening. One day he drove into Ossining and bought some copper wire and black paint. Possibly inspired by Bud Haley’s wire animals—definitely inspired by Theodore Cornu’s encyclopedic knowledge of local history—Ed drew sketches of seven historic Croton River bridges. As Dorothy read aloud each night, he bent and cut the wire, slowly soldered the pieces together and then painted the finished bridges black. Once they were done, the question was—where on earth to put them? Their living room had been painted pink by the previous owners. Ed and Dorothy hadn’t yet hung anything on the walls because they thought a pink wall would make anything they put up look rather odd. Why not hang the new wire bridges? After all, the wall behind their couch was long . . . the Croton River was long . . . what a perfect combination! River map in the background. So Ed got a map and carefully painted the Croton River, snaking in light blue across the wall, and then hung the bridges in their approximate locations on the map. Over the years, he added more bridges, and the New Croton Dam, the Underhill mill, Van Cortlandt Manor, the ferry house and the ferry itself. Everything was painted black, except for touches of red and blue on the flag above the Revolutionary War bridge that George Washington crossed on his way to victory at Yorktown. 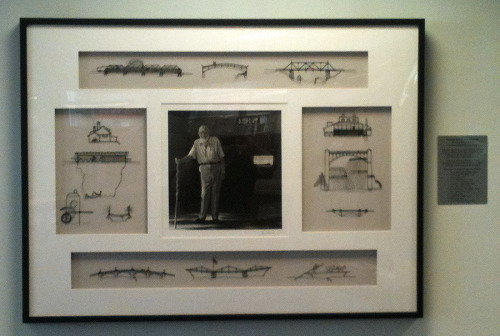 Ed’s wire sculptures are now on permanent display at the Croton Free Library. When Ed Rondthaler passed away, at the age of 104, his family generously donated Ed’s wire sculptures to the Croton Free Library, where they are now on permanent display. They have much to tell us about the fascinating history of the Croton River and the inventive, creative, passionate and beloved man who created them. So let’s climb into our canoes, paddle up the river, and see the wonderful gift Ed left for us.